Poland has long eyed Norway’s oil and gas resources in its quest to diversify its sources of imported energy. In February, during her visit to Oslo, Poland’s Prime Minister, Beata Szydlo, re-animated Warsaw’s vision of a pipeline, linking Poland to Norway’s North Sea gas fields stating that: “on behalf of the Polish government, I can say that we will do everything to create the right conditions, so that this project can finally be carried out." Poland consumes some 16 billion cubic meters (bcm) of natural gas a year, mainly at chemical and fuel plants. 60% of that gas is imported from Russia. Over the last decade, Warsaw has worked assiduously to reduce that dependency. On April the 1st, 2014, Poland significantly increased its capacity to import gas from Germany, when the two nations completed investments that give reverse flow capacity to their respective sections of the Yamal gas pipeline. That pipeline was built to send Soviet gas westwards to Europe. Today, it can direct some 2.3bcm per year of gas in the opposite direction to Poland, and up to 5bcm in the event of a Russian supply cut off. LNG terminal in Świnoujście, a port on the Baltic Coast, located near the border with Germany, will start its operation in the mid of this year, with its capacity to handle 5bcm of gas per year. The terminal effectively links Poland to the increasingly global LNG market. Together, the LNG terminal and Polish own productions of 4.5 billion cubic meters (bcm) covers almost 60% of Poland’s demand for gas. A direct tie to Norway’s North Sea gas fields would further diversify Poland’s gas suppliers. A key element of this vision has been the Baltic Pipe, a project dating back to 2000. 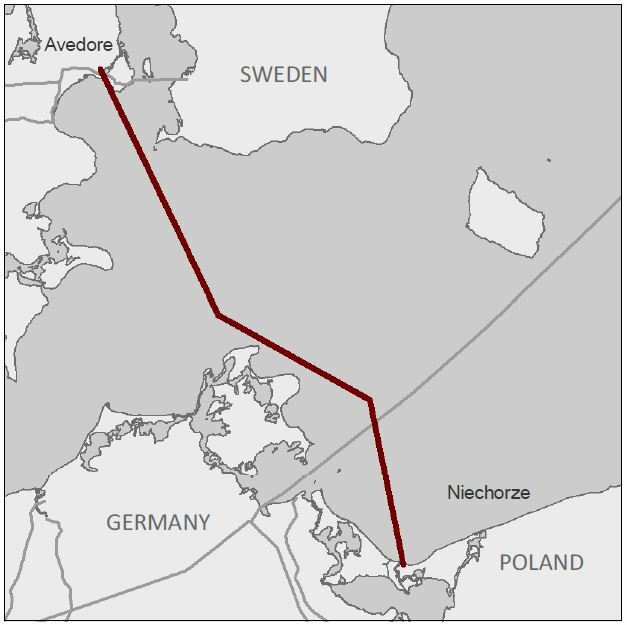 The Baltic Pipe is a proposed, 250 kilometre, bi-directional, sub-surface pipeline that would link the gas lines near Kovenhavn on Denmark’s eastern coast, with those in Świnoujście. The EU is now supporting a feasibility study on the project, examining variants ranging in capacity from 2 to 10bcm per year. The Baltic Pipe is estimated to cost approximately 350m. euros, and is included in the EU’s list of Projects of Common Interest (PCI). Skanled’s demise was a major setback for the Baltic Pipe, even with the latter’s potential to direct Russian gas and excess gas from the Świnoujście LNG terminal to Denmark. Nevertheless, Poland’s interest in the Baltic Pipe has been given new impetus by the approaching termination date of contracts between the nation’s largest gas operator, PGNiG, and its main supplier, Gazprom. PGNiG currently buys up to 10.2bcm of gas a year from Gazprom, and that deal will end in 2022. PGNiG, which has invested in several Norwegian off-shore gas fields, and its’ Polish government owners, see a strategic opportunity to further reduce their nation’s heavy reliance on Russian gas, if the Baltic Pipe, with the necessary Nordic spurs, can be constructed by that date. Another Polish company, Grupa LOTOS S.A., is as well active on the Norwegian off-shore gas fields. The first and simplest option would be to link the Baltic Pipe to Norway’s Statpipe and Denmark’s North Sea fields. Norwegian gas would enter the Danish pipeline infrastructure, before flowing though the Baltic Pipe. This approach has been projected to bring some 3-4bcm of Norwegian gas to Poland. A second, more challenging option involves building a new pipeline linking the Draupner and Sleipner gas fields in the Norwegian North Sea, to the west coast of Denmark. Gas would traverse Denmark to reach the Baltic Pipe. According to ICIS, this option could send up to 10bcm per year to the Baltic Pipe, a level of flow that would require upgrades to the Danish gas transmission system. Poland’s renewed pipeline ambitions for the North Sea, however, have yet to reignite Norwegian interest. To a certain degree, the prospects of a Norway-Poland gas link are being buffeted by Warsaw’s and Europe’s success with energy diversification. The European market now anticipates, not only the arrival of Azeri gas in 2019, via the Trans-Adriatic Pipeline, but also Iranian gas and LNG from the United States, and possibly even from Australia. In late January, Statoil, Norway’s leading gas and oil production company, stated that it has no plans to invest in the pipelines advocated by Poland. Gassco, a main operator of Norway’s off-shore pipelines, said that, for now, it will not build additional links to continental Europe. The operator asserted that its current pipelines are “optimised,” meaning that current and projected production in the North Sea is matching its capacities. During a visit to Washington, D.C. in late February, Norway’s Minister of Petroleum and Energy, Tord Lien asserted that current and expected market conditions do not favour a Norway-Poland pipeline. In his view, the gas demand necessary for such an investment, has yet to be demonstrated. He suggested that a more feasible option with which to increase Poland’s import of Norwegian gas, would be to expand Poland’s linkages to gas networks to its west, particularly in Germany. The Baltic Pipe is an initiative of strategic importance, not only for Poland, but for Central Europe as a whole. Increased access to Norwegian gas would bring greater and much-needed balance to Poland’s portfolio of energy suppliers, and that of its neighbours, including, with the right interconnectors, Ukraine. Baltic Pipe is an initiative of strategic importance, not only for Poland but for Central Europe as a whole. Increased access to Norwegian gas would bring greater and needed balance to Poland’s portfolio of energy suppliers and that of its neighbors, including, with the right interconnectors, Ukraine. However, If Baltic Pipe and its Nordic spurs are to become a reality, recognition of its geopolitical value will have to be matched by confidence in its commercial value.